Sharon, 3 vs. Norwood, 2 – Final – Sharon scored a pair of goals in the final five minutes to erase a one-goal deficit and land a one-goal win. Freshman Bryce Nathan converted a free kick just outside the area in the 34th minute to bring the Eagles level. Norwood went up 2-1 in the 57th minute but the Eagles leveled the match when Antonio El Khoury scored on a bicycle kick inside the area in the 76th minute. Senior Andy Reyes-Jones headed in the winner in the 78th minute off a long throw-in from classmate Tyler Hippler. Attleboro, 1 @ Franklin, 3 – Final – Attleboro took the lead early but junior Annie Walsh tied the game last in the first half for the Panthers. FHS junior Cassi Ronan then scored the next two goals to give the Panthers the win. Franklin coach Lisa Cropper noted that senior Kyla Aldred played a strong game on defense. Canton, 1 @ Foxboro, 1 – Final – Click here for a recap and photo gallery from the game. King Philip, 0 @ Mansfield, 1 – Final – Click here for a recap and photo gallery from the game. Taunton, 0 @ Oliver Ames, 2 – Final – Oliver Ames freshman Hannah Stryke scored a pair of goals in the first half to help the Tigers qualify for the state tournament. Senior Sarah Stevens assisted on the second goal while senior Caitlin Grant made two saves in net. Stoughton, 6 @ Sharon, 1 – Final – Julia Russell led the Stoughton offense with three goals while Jackie Evangelista scored a pair of goals and Brittni Paul found the back of the net once. Emily Locke scored for Sharon. Attleboro, 0 @ Franklin, 3 – Final – Franklin defended home court with another balanced offensive attack. Hailey Sanders and Meaghan Maguire each recorded eight kills for the Panthers while Maggie Doyle had four kills to go along with 14 service points and a pair of blocks. Junior Lauren McGrath added 21 assists and 14 service points in the win. Canton, 3 @ Foxboro, 0 – Final – Canton went on the road and recorded a 25-20, 25-19, 25-16 sweep of Foxboro. Erin Devine had five kills and five blocks for the Bulldogs. Canton head coach Pat Cawley noted that Caitlyn Cahill had some clutch serving and good defense while Angie Elias came off the bench and provided a spark on offense. King Philip, 3 @ Mansfield, 0 – Final – King Philip picked up the sweep on the road over Kelley-Rex rival Mansfield, walking away with a 25-18, 26-24, 25-20 in a competitive contest. Sydney Phillips led the offense with 17 kills, five digs, and two aces while Michaela Palumbo added 10 kills, nine service points and a pair of aces. Grace Ely added four kills while Julianne Rando chipped in with six digs and six aces. For Mansfield, Julia Harrison led the offense with 11 kills while Meg Hill added 10 kills. Jolie O’Neil, Sam Sternberg, and Katie Dardinski each had 10 digs for the Hornets. North Attleboro, 3 @ Milford, 1 – Final – North Attleboro picked up a tight win on the road, leaving Milford with a 25-23, 25-27, 25-22, 26-24 win over the Scarlet Hawks. Taunton, 2 @ Oliver Ames, 3 – Final – Taunton won two of the first three games but Oliver Ames battled back to win games four and five and earn the win (24-26, 25-16, 14-25, 25-15, 15-4). Katie Flynn led the way for the Tigers with 14 kills while Emma Petrillo also had 14 kills as well as six aces. Allie Kemp finished with 36 assists, Sadie Homer added 32 digs and a pair of aces and Kayla Raymond slammed down eight kills with six blocks. Stoughton, 3 @ Sharon, 1 – Final – Stoughton bounced back after dropping a tight first set to win the next three and earn its 15th win of the season (27-29, 25-13, 26-24, 25-17). Senior Val Whalen led the way with 16 kills and 23 digs for the Black Knights while junior Molly Turner added 17 assists and 16 digs and junior Hanna Holden chipped in seven aces. North Attleboro, 1 @ Attleboro, 1 – Final – Attleboro sophomore Michael Russo scored the equalizer inside the final five minutes to help the Bombardiers take a point against unbeaten North Attleboro. The Rocketeers took the lead in the first half in the 34th minute. Jeff Gale flicked on a free kick service from Gabe Pinhancos and Zach Matracia buried his volley to put Big Red up 1-0. The Bombardiers tied the see-saw game in the 77th minute, heading in a free kick from junior Aidan Lancaster. Canton, 1 @ Franklin, 2 – Final – Franklin scored two goals in the first half, both on assists from senior Andrew DiLeo, to beat visiting Canton. The Panthers took the lead inside the first five minutes when DiLeo set up junior Nick Barry for the game’s opener. DiLeo then assisted on junior Tim Duval’s game-winner, coming at the half-hour mark of the first half. Canton cut the deficit to one just before half. Foxboro, 2 @ Taunton, 0 – Final – Foxboro junior Shane VandenBoom scored on both sides of halftime to lift the Warriors to a win on the road. VandenBoom opened the scoring in the 20th minute, converting a chance from Ryan Kelley. The junior then iced the game, doubling the lead in the 75th minute. Stoughton, 0 @ King Philip, 10 – Final – King Philip built a 6-0 lead at halftime and never looked back in a big win over visiting Stoughton. Senior Tyler Mann and junior Anthony Bozza each scored a pair of goals, Zac White notched two helpers and senior Thomas Lugten had two assists and one goal. Senior Eric Woolson added a goal and an assist in the win. Sharon, 2 @ Mansfield, 2 – Final – Mansfield raced out to a two-goal lead but the visiting Eagles battled back to earn a point on the road. Sean Lanzillo put the Hornets up 1-0 on a feed from Sam Hyland and senior Cullin Anastasia doubled the lead on an assist from Luke Savoie as Mansfield took a 2-0 advantage into halftime. Sharon cut the deficit in half when sophomore Brian Higgins netted one on a clearance off a corner kick in the 55th minute. The Eagles scored the equalizer 10 minutes later when sophomore Michael Baur scored on a free kick from just over 20 yards out. Milford, 1 @ Oliver Ames, 5 – Final – Oliver Ames senior Cam Vella opened the scoring in the 18th minute, dispossessing a Milford player at midfield and making a darting run on goal before finishing from outside the box. The Tigers doubled its lead moments before halftime when James Gillespie won possession on the sideline and connected with Brandin Osborne, who found Nathaniel Cardoza on a run into the area for the finish. Gillespie nodded home OA’s third goal on a throw from Chris Lawrence in the 45th minute, Niko Byron made it 4-0 with his first career goal, converting a rebound off Lawrence’s shot and senior Jack Galas converted a penalty kick for his first career goal in the 75th minute. Milford senior Jacob Balzarini scored his first career goal, burying a half-volley on a corner kick. North Attleboro, 2 @ Attleboro, 1 – Final – North Attleboro broke a tie game with just under three minutes to play to grab two points on the road. Ashlyn Gaulin continued her strong season, scoring the game-winner in the 78th minute on an assist from Leah Jetter. North Attleboro took the lead when Haley Guertin opened the scoring on a feed from Kayla Pasquel. Attleboro equalized with just under two minutes to play in the first half. North Attleboro head coach Bill Wallace added that Aine Mendonca, Felicity Monfils, Haley Ferrin and Emma Gauin all played great two-way soccer. Franklin, 1 @ Canton, 4 – Final – Click here for a recap and photo gallery from this game. Taunton, 0 @ Foxboro, 6 – Final – Lizzy Davis scored a pair of goals and Lily Sykes added a goal and an assist for the Warriors. Katie Huether, Shaina Abbott and Mia Oglia also scored for Foxboro and Warriors coach Katie Stalcup said that Alex Stamatos and Sykes both had great games. King Philip, 5 @ Stoughton, 0 – Final Avery Snead scored two goals and set up a pair of goals for classmate Chloe Layne as the Warriors earned their 11th win of the season. Emma Corcoran and Ally Stanton assisted on the Snead goals and Jenna Midura scored an unassisted goal with two minutes remaining for KP. Melina Connolly made three saves to earn the clean sheet. Mansfield, 1 @ Sharon, 0 – Final – Stephanie Kemp scored the lone goal of the game in the first half off an assist by Erin Daniel. Sharon had its chances to equalize and was “unlucky,” according to head coach Brad Furnival, including a Sabrina Robbins free kick that struck the underside of the bar. Oliver Ames, 1 @ Milford, 0 – Final – Sofia Masciarelli scored the lone goal of the game seven minutes in to the second half off an Erin Holmberg assist. Olivia Marshall played well in net, according to Milford coach Jay Mastaj, making four saves for the Hawks. Stoughton, 6 @ Brockton, 0 – Final – Meghan Foley scored two goals to pace the Black Knights to a season sweep of Brockton. Julia Russell, Jackie Evangelista, Haley Apotheker and Kamryn Oliveira each scored once for Stoughton. Kayleigh Marinelli had her first career shutout in goal. Canton, 0 @ Franklin, 3 – Final – Franklin picked up its eighth win of the season with a 25-15, 26-24, 25-12 sweep of visiting Canton. Lauren McGrath set the offense in motion with 31 assists, setting up Lauren Lockhart and Ellie Wisniewski (eight kills apiece). FHS head coach Kate Horsmann said Lauren Bissanti and Riley Marino both had strong serve receive and defensive games for the Panthers. Canton head coach Pat Cawley said freshman Angie Elias played well at the net while Sophia Connor had a strong game defensively. Foxboro, 0 @ Taunton, 3 – Final – Taunton defended home court with a 25-13, 25-22, 25-18 sweep of Foxboro. Sam Reaume led the offense with 10 kills, five digs, two aces and a block while Kayli Fagan finished with 23 assists, five kills, three aces and three blocks. Sam Silviera chipped in with six kills for the Tigers. Sharon, 1 @ Mansfield, 3 – Final – Mansfield rallied after dropping the first game to win the next three, grabbing a 19-25, 25-17, 25-19, 25-12 win over visiting Sharon. Julia Harrison had eight kills and eight digs, Lexi Gardner added 18 service points and six kills and Jolie O’Neil had 16 digs and 12 service points. Milford, 2 @ Oliver Ames, 3 – Final – Oliver Ames edged out Milford in an incredibly close match, taking the first, third and fifth games to beat the visiting Hawks (25-18, 22-25, 25-19, 23-25, 15-13). OA sophomore Ally Kemp paced the Tigers’ offense with 25 assists while senior Kayla Raymond finished with 14 kills and two blocks. Senior Emma Petrillo added eight kills and four aces, junior Sadie Homer added 15 digs and two aces and junior Grace McCallum was tabbed player of the game by head coach Chelsea Cunningham. “Her commitment to the back row was solid throughout the whole match and she held the team’s composure in the height of the match,” Cunningham said of McCallum. Stoughton, 0 @ King Philip, 3 – Final – King Philip picked up a big win in a crossover match with Stoughton behind a balanced attack. The Warriors, who won 25-16, 25-15, 25-19, got nine kills from Sydney Phillips (four digs, two aces, seven service points), seven kills from Grace Ely and five kills from Michaela Palumbo (nine service points). Elise Pereira added eight service points, four digs and three aces in the win. Oliver Ames, 161 @ Franklin, 170 – Final – Oliver Ames senior Ryan McGarry earned match medalist honors, carding a low-round of 38 to lead the Tigers to a win at Franklin Country Club. Nolan Donza, Matt Kelley, Mark Bissonette, Thomas Walsh and Eric LeBlanc all shot 41 for OA. Canton, 173 @ Foxboro, 181 – Final – Canton punched its ticket to the MIAA state tournament for the eighth straight year, improving to 7-0 with a win over Foxboro. Jack Goyetch earned match medalist honors with a round of 41 while Thomas Singleton helped the Bulldogs with a round of 42. Joey Vaughan, Chris Lavoie and Niko Donovan each shot 45 for Canton. Logan Sloan, Matt Lathrop and Steve Foster each carded rounds of 45 for the Warriors. Mansfield, 166 @ Attleboro, 164 – Final – Attleboro’s Ethan Johnson earned match medalist honors, shooting a low-round of 38 to lead the Bombardiers to a close win over Mansfield. Kyle DelSignore and Corey McKenna each added rounds of 41 while Taron Mills shot a 44. Freshman Brian Lee led Mansfield with a 40 while classmate Ryan Dow added a 41 for the Hornets. Milford, 181 vs. Nipmuc, 156 – Final – Andrew Fauerbach had a strong day for the Hawks, shooting a team-low round of 39 for Milford. North Attleboro, 155 @ Stoughton, 181 – Final – North Attleboro picked up a win at Easton Country Club with Marcus Costa’s medalist round of 36 leading the way for the Rocketeers. Dylan Kane (39), Colby Cameron (40) and Jillian Barend (40) also factored in for Big Red. Stoughton’s Brendan Campbell had a team-low round of 38 while Nick Szum added a 44. Taunton, 194 @ Sharon, 175 – Final – Sam Fergenbaum led the way for Sharon, carding a team-low round of 41 while Max Brody added a 42 for the Eagles. After registering just four wins a season ago, Big Blue is hoping for a big bounce back year in 2017. The toughest task will be finding replacements for the large amount of seniors that have graduated over the past two seasons. A big reason for hope to get back towards state tournament competition is four-year varsity player Grace Mayer. Mayer has been one of the top players in the Hock over the past couple of the seasons and led the Bombardiers with six goals and three assists for nine points. She will be joined on the forward line by junior Alexis Compton and junior transfer Takara Keele. Head coach Lindsay Antunes said her midfield has been strengthened “immensely” by sophomore Anna Beck, who was pulled up mid-season last year. Canton is returning a strong core of players from a 13-win team a year ago and will be in the hunt for the Davenport title. Key returning players include senior forward Andrea McNeil and junior forward Maggie Malloy, who will be back to pace the Bulldogs’ offense, as well as senior midfielders Emily Campbell and Maggie Wade. With experience back in the mid, the Bulldogs expect to have a strong passing game and strong ball control. Senior Riley Brown will step in as the starting goalie and freshman Maria Femia could make an impact as a rookie. Coming off its best season in program history, Foxboro is now focused on 2017 and trying to write its owm chapter in the history books. While the Warriors graduated over a half a dozen seniors, they return last year’s Hockomock League MVP in goalie Kelli McCarthy as well as 2016 HockomockSports.com Underclassman of the Year Lily Daly. With experience on both ends of the field, Foxboro is set up nicely for 2017. Daly has led the Warriors in scoring in each of the past two seasons. The middle of the field will look most familiar from last season with seniors Jackie Brion and Catherine Luciano, and juniors Meghan Curran and Sophia DiCenso all returning after playing valuable minutes last season. The biggest challenge for the Warriors could be replacing starting defenders Kelly Fisher and Angela VandenBoom, who both graduated. The defending Kelley-Rex division champions are in a good spot with so many returning players from last year’s squad. Leading the way is HockomockSports.com Player of the Year Annie Walsh, who led the Hockomock League with 25 points a season ago. Cassi Ronan (16 points) and Erin Walsh (10 points) are also back as Franklin returns its top three scorers. Another positive is that Franklin has some experience back on the defensive end as well. Kate Morse is back to anchor the unit after an impressive junior season and will be joined by Meri Gendreau and Emily Valentino in front of goalie Christina Luccini. Head coach Lisa Cropper expects senior Maddie Hinckley and freshman Victoria Quinn to also play big roles for the Panthers. After coming just a point shy of splitting the league title with Franklin a season ago, King Philip returns a strong core that will look to make another push for the Kelley-Rex crown. One big reason that the Warriors will be in the mix is because senior goalie Abby Campbell is back in the cage this season. And in front of Campbell, KP returns senior Christina Hathaway – two big reasons why the Warriors allowed only 13 goals all season in 2016. The offense will look very familiar with senior Liz Furfari (13 points) and junior Alli Meehan (25 points) back in the fold. Juniors Kate Lindmark and Caroline Klim will help bolster the defense while Nicole Connor and Dana Truini will be important players in the midfield. Mansfield is relying on seven returning seniors and a mix of young players as they look to get back to the state tournament yet again this season. The Hornets have senior leadership all over the field, which will be important in a very deep and talented league. Up top, Mansfield had Heather D’Amdra and Kristina O’Connell, while seniors Emily Ierardo and Ann Maher will lead the way from the midfield. On the defensive end, seniors Nicole Berluti, Julia Burhman and Brittany Lam will anchor the back line. Although the Hawks graduated 11 seniors from last year’s squad, they return some key pieces that head coach Kim Danish is hoping will help Milford take a step forward. The Hawks will lean on tri-captains Shannon Cormier (the team’s leading scorer last season), Danielle Fokas (who will start on the wing) and Emily Condon (a returning member of the Hawks’ defense) to pave the way this season. Kate Wimette, Colby Bowers and Megan Larouco will see time in the midfield while Julie Rabinowitz would see time all over the field, depending on need. Milford is looking to rely on speed on offense to try and get the offense going. Oliver Ames will be relying on a mix of experience and youth as they try to stay competitive in a deep Kelley-Rex division. It starts with senior captain Sarah Stevens in the midfield, who will be the “quarterback” of the midfield according to head coach Abby Tepper. Senior Cristina Boudreau and junior Kayla Lozzi will bolster that midfield while senior Liz Nuss will provide speed to the attacking group. OA’s defense will be anchored by senior captain Sarah Tetrault while senior Caitlin Grant will be the starting goalie. Freshman Brynna Courneen has impressed defensively early on. Now in her third year at the helm of the Sharon Eagles, head coach Andrea Vandette is confident that her squad is ready to take the next step and find some more success. The Eagles are led by three captains: Elyse Korn, Abbi Solomon and Grace Leavitt. Leavitt started to come on strong at the end of the year last season and will be the anchor for the Eagles’ defensive unit this season. Senior Lindsay Moses will be be in the cage and has a good amount of varsity experience under her belt. In the midfield, Leora Leavitt will be in the center of the field and one of the Eagles’ most reliable players. Vandette is also expecting juniors Veronica Wallace and Stephanie Edwards to continue their growth after picking up the sport a season ago. Despite graduating a handful of talented players, including 2015 Hockomock League MVP Angela Connolly, Stoughton head coach Dan Mark is bringing back several key players for the 2017 version of the Black Knights. The Black Knights’ offense will look the most similar to last season’s team that qualified for the state tournament. Julia Russell, Kamryn Oliveira and Jackie Evangelista are returning forwards who played regularly last year. Lisa Ramanauskas is a returning midfielder, and Haley Bushlow is back to anchor the back line. Gianna Barbosa will be the starting goalie again this season. “We have several returning players who played many minutes last year and are expected to step in as starters this year,” Mark said. Abby Campbell, King Philip – Campbell has been one of the top goalies in the league for the past two seasons and helped KP come within a point of sharing the league title with Franklin last season and reaching the Div. 1 South semifinal. She had 11 shutouts in 2016 and saved 130-of-143 shots that she faced, finishing with a goals against average of 0.619. Emily Campbell, Canton – Campbell was a versatile weapon for the Bulldogs, helping out both in midfield and defense to help Canton win 13 games and achieve a plus-40 goal differential for the season. With Campbell playing a critical role, Canton allowed only 14 goals on the year, which was second best in the league. She also chipped in with three goals and seven assists. Lily Daly, Foxboro – Daly has been the leading scorer for the Warriors in each of her two varsity seasons, helping Foxboro win its first league title in 11 years and its first ever Div. 2 South title. Daly is a force near the net and was chosen as the HockomockSports.com Underclassman of the Year after scoring 16 goals and recording 11 assists. Emily Ierardo, Mansfield – Ierardo emerged last season as one of the top offensive weapons for the Hornets, helping Mansfield make another run at the league title and reach the second round of the state tournament. She played five different positions in the forward and midfield areas and she scored nine goals and recorded six assists last fall. Maggie Malloy, Canton – Malloy made quite the impact in her first season playing field hockey. She jumped onto the Canton varsity squad early in the season and finished as the league’s top goal scorer with 16 tallies for the year. She was a big reason for Canton’s improvement offensively and this year, with a season of experience, Malloy could have even bigger numbers. 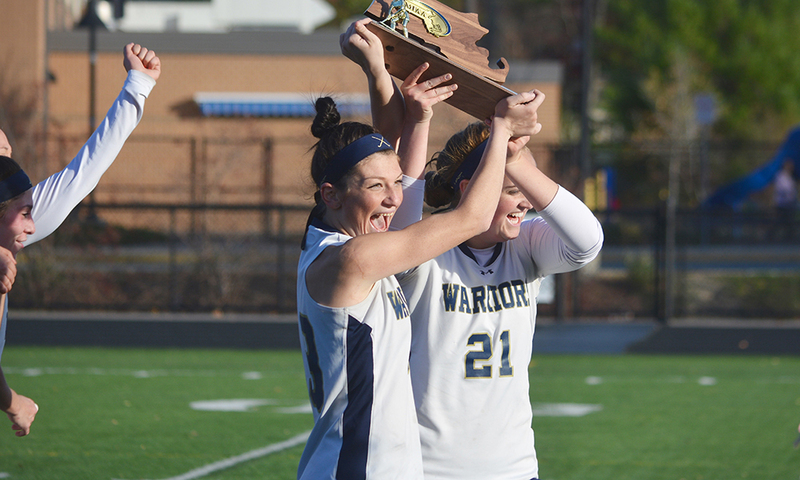 Kelli McCarthy, Foxboro – Voted Hockomock MVP by the league’s coaches, McCarthy was the backstop for a Warriors defense that was one of the best in the league and helped Foxboro claim a Davenport division title and its first ever Div. 2 South title. She finished with 115 saves on the season and recorded 15 shutouts in 23 games, allowing only 13 goals total. Alli Meehan, King Philip – Meehan was integral to KP making a run at the league title last season, holding a lead into the final week of the regular season, and reaching the Div. 1 South semifinal. Meehan scored 14 goals and recorded 11 assists to tie for the league-high in points. She also assisted on the goal that forced overtime against Somerset-Berkeley in a state tournament win. Cassi Ronan, Franklin – Ronan was a versatile cog in Franklin’s league championship season in 2016, playing both midfield and forward for the Panthers. She finished with 10 goals and seven assists, while being named to the HockomockSports.com First Team, but also did a lot of the defensive work that didn’t show up in the box score. Sarah Stevens, Oliver Ames – Stevens had a strong season for Oliver Ames in 2016 and the senior will be counted on to create scoring opportunities for the Tigers again this fall. She scored six goals and recorded nine assists for OA last season, helping the Tigers get to 11 wins on the season, beat Durfee in the first round of the playoffs, and push perennial power Walpole to overtime. Annie Walsh, Franklin – Walsh is the reigning HockomockSports.com Player of the Year (she was also Player of the Year in girls’ lacrosse) after leading the Panthers to a Kelley-Rex division title. A year after being named Underclassman of the Year, Walsh took her game to another level with 14 goals and 11 assists for a league-high 25 points. Oliver Ames, 2 @ Sharon, 0 – Final – Junior Matt Campbell scored his second goal of the season, putting Oliver Ames in the lead 20 minutes into the game. Senior Thomas McCormick iced the game for the Tigers, finding the back of the net in the final minutes of the match. Junior Cam Vella assisted on both of the goals while Jack Carroll earned the shutout. Franklin, 2 @ Xaverian, 1 – Final – Franklin rallied from a one goal deficit with a pair of second half goals to earn the win. Farley Asmath scored off an assist from Cam LeBlanc to tie the game while Kevin Hall scored the game winner for the Panthers. Sharon, 1 @ Oliver Ames, 5 – Final – Francesca Calabraro scored four goals for the Tigers. Julia Roy had the other goal for Oliver Ames. Alex Rabb scored the opening goal of the game for the Eagles, who trailed 2-1 at halftime. King Philip, 3 @ Foxboro, 0 – Final – The Warriors of Foxboro gave the Warriors of King Philip a big test but KP emerged with a 25-19, 26-24, 28-26 win, one head coach Kristen Geuss described as “hard earned.” Sydney Phillips led KP’s attack with 13 kills while Emma Lopez chipped in six kills. Franklin, 1 @ Milford, 3 – Final – Milford won 29-27, 25-15, 21-25, 25-13. Kelley Reichert led the Hawks with 11 kills and Ally Zagami had seven kills and 17 digs in the win. Attleboro, 2 @ Stoughton, 1 – Final – Attleboro scored once in the first half and once in the second half, while keeping the Black Knights off the board until the final minutes of the game to get the win. Kate LeBlanc put the Bombardiers in front with an unassisted goal in the first half. LeBlanc doubled Attleboro’s lead in the second half on assists from Eliza Sabilla and Ally Pierce. Jackie Evangelista scored her first varsity goal for Stoughton. Mansfield, 1 @ Canton, 0 – Final – Caitlin Whitman had the lone goal of the game for the Hornets, scoring an unassisted tally midway through the second half. King Philip, 1 @ Foxboro, 0 – Final – King Philip followed the game plan they set in place and executed across the field in a big 1-0 league win over Foxboro. Caitlin Donahue scored the lone goal of the game off of an assist from Liz Furfari. Franklin, 5 @ Milford, 1 – Final – Senior Alex Sullivan and senior Brayden Downing found the back of the cage in the first half as the Panthers built a 2-0 lead by halftime. Junior Kate Morse had a pair of goals off of corners with assists coming from Maddie Hinkley (her second) and Cassi Ronan. Caroline Lounsbury capped the scoring off an assist from freshman Maeve Ledwith. Senior Sam Hertzberg made a pair of saves, including one on a breakaway, to earn her first win. Shannon Cormier scored Milford’s goal in the game. Taunton, 0 @ North Attleboro, 2 – Final – Taunton’s defense had a strong showing but couldn’t convert on the offensive end as North Attleboro picked up the win. Taunton received strong performances from Katie Van Zandt, Annie Tate, Liana Duarte, Bre Conlon, Jillian Pagliuca and Kya Enos. Oliver Ames, 7 @ Sharon, 0 – Final – Oliver Ames continued to roll to start the season with a big win on the road. Sarah Stevens and Dimitra Efremidis each netted a pair of goals for the Tigers with Kendall Clifford, Rachel Stryke and Shannon Cahill each scoring once. Kayla Lozzi had two assists in the win while Liz Nuss and Efremidis each had one helper. Oliver Ames, 148 @ Stoughton, 181 – Oliver Ames picked up its second win of the season, defeating Stoughton at Easton Country Club. Brady Allbritton led the Tigers with a 36 while Nick Lombardi and Eric LeBlanc each shot 37, and Mark Bissonette and Matt Kelley each carded a round of 38. Stoughton’s Brendan Campbell shot a 43. King Philip, 157 @ North Attleboro, 144 – Final – North Attleboro senior Robbie Congdon shot a one under par 34 at Heather Hills to lead the Red Rocketeers, who moved to 3-0 on the season. Taunton, 175 @ Attleboro, 170 – Final – The Attleboro Bombardiers picked up their first win of the season in their home opener at Highland Country Club. Ethan Johnson led Attleboro, shooting a 40 while Kyle DelSignore and Corey McKenna each registered a round of 42. Taunton’s Mike Volkmann was the match medalist, shooting a 39.